when the trend has faded…. I’ve had this kimono for several years and my love for it is still going strong. Kimonos seemed to stir up the most angst among the GYPO Summer Style Challenge participants. sent me a picture of herself in a kimono , recently! Still can’t believe I am wearing more shorts this year. The addition of the wedges helps my curvy petite figure. 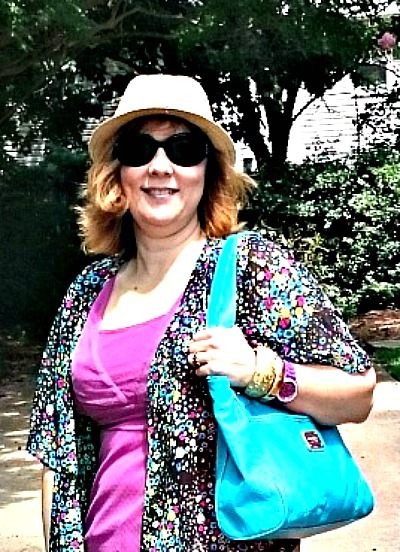 Check out this how this wonderful blogger styles a kimono for the 50’s , 60’s and 70’s woman! Dear Readers , you know I love completer pieces and along with kimonos, short sleeve cardigans, and shrugs, that I also love vests for Summer over tank tops and I bought a new one. The extra eyelet detail really sold me , as any extra feminine touch suits my style! I am grateful for my knee feeling much better today! I am grateful that my sons woke up and got to my youngest’s private bowling lesson today, because this insomniac was still asleep! I am grateful that my daughter made it back to Boston and that I touched base with her last night…. she found that a mouse had gotten into all her food upon her return. The roommates had the exterminator come that day, so let’s hope this situation ends soon.. I am grateful that Saturday night we begin our fun Summer bowling league!